Just popping in to see how you're all doing! It's chilly here again in the Northeast, but then again, February generally is. I really don't mind, because I'm hunkered down to work. It's chaotic here. With the juggling act, it feels like I'm one step away from dropping the ball. Right now, Sinner Repent (1) is in the process of re-edit. When I received it back, it didn't feel right. It was choppy and not to my standard, so my awesome team took it back and ripped it apart. Now, it's days from final edit being complete, and I'm praying it 'feels' better when I do my read through. If not, it won't be released. I really like Callista Carter and Quinton Gaines, and I can't give them a subpar story. It's not about banging out 'ehhhh' work. It's about delivering stories I believe in. So, if the book isn't where I want it, I won't release it. I will say, I'm a million times happier now than I was 2 weeks ago. My proofer, Rachel, dug into it and found problem areas. Now, Jennifer is doing the final edit. I like when they're mean, vicious, and brutal. (Yes, I'm sick like that. hahahahah) Corrections are being done, and we're looking at the release date to remain the same. If it's perfect, you'll see Sinner Repent 'born' on March 21st. If I can get it to you earlier, I will. Love is Bleeding is my other project right now. It's in the process of being edited and proofed. I'll be honest. I'm scared shitless. I always am when someone reads the book for the first time. No one sees them before the editing team. So, if they hate it, I'm basically screwed. There goes 150,000 words. I'm not one to patch things up. If I hate it, or it's not to standard, it's deleted and redone. I'm praying that my team loves it, but I still have this fear. Why you ask? As you know, I'm not afraid of controversy. I'll throw down some threesomes, I'll drop some profanity, and torment the reader to the end. BUT, this book was hard. I love a happily ever after, and I was torn. Are Paris and Tessa soul mates? How far could I push love before it shatters in pieces? Yeah, it wasn't easy. I'm a big believer that if a book makes me cry, then it's giving the perfect amount of emotion. I'm not one to weep. In fact, very few things can break me down. This book made me sob. I don't know if it's guilt, or I hit it perfectly. Now, to answer a few questions. Morgan, I love your books because they're totally different. Thank you for sharing them with us. I have a huge question that has been driving me insane. Why the hell are you doing a trilogy? That isn't like you. What's with that? That's funny! I ask myself that all the time. I'm going to let you in on another secret. I haven't even told my editor or proofer this. The Sinner trilogy will end with a chance for it to be a series. Callista will have her story, then Luke, and finally Nate. THEN, with that last book, as I write the epilogue, I'll have the opportunity to spin it off or end it. I know how to do it, either way. It's a matter of what my workload is, if you all like the trilogy, and if I can handle another series. I'm already carrying four. Will five make me loopy? If I do make it a series, then it's going to be paranormal and tie into the FBI series. So, like most of my books, you'll see characters crossing over. Since in the Sinner series, Nathaniel Carter's boss is Gabe Rothschild, I've left myself a way to connect it. So, Molly, to answer your question... It will be a trilogy, but with a possible series to follow. You seem really genuine. Is that you on FB, or do you have someone who posts for you? How do you have time to write your novels, post on FB, and still have a life? Well, where do I begin. Yes, that's me on FB, as is here. I don't have an intern (Oh I wish I did!) or anyone else who posts or writes for me. This is Morgan in her finest (and not so finest) moments. I believe in what I do. I'm a writer. I'm a storyteller. If you message me on FB, I will reply. If you email me, I will answer. I believe that I can only be who I am because of all of you. As for genuine, (thank you for that) this is the real me. I laugh, post pictures of my husband (the inspiration for Greyson Croft) and love the interaction. How I balance it all? I have no freaking clue. I'm blessed with a husband who is laid back, so if there's laundry in the dryer, he doesn't lose his mind. I'm more the control freak. (Thus the ulcer!) My daughter is a pre-teen and she's cyber schooled, so she is pretty self sufficient. I'm a firm believer in making her take personal accountability. She makes her own bed, makes her own lunch and breakfast, and is caretaker of her pets. I'm a control freak, but I have my limits. My son is going to be five soon, and he's in preschool, so I have empty nest syndrome. Once he can read (he's almost there thank god!) he'll be cyber schooled too. So, I don't have bus stop duty, or the other things that cut into a person's time. He's more high maintenance, but he's my little buddy. He'll give me book ideas (cats who eat bugs are bound to be a best seller) and keeps me company. I'll write ten pages and then play Memory, or Chutes and Ladders. Then back to the grind. We don't have cable TV and the kids aren't allowed electronic devices during the week, so it's harder M-F. Sometimes, I want to cave and tell them play a video game. As of yet, it hasn't happened. I get up at 2 am every day. I write uninterrupted from 2-7, and then get the kids situated. Then, I edit/write from 8-12. At lunchtime, I feed the kids and myself. When that's done, I play with them, or spend time reading to my son. My daughter usually has a paper to write, or edit and that's my afternoon fun. We're doing Harriet Tubman now. By 3 pm, I'm starting to wear down. I make dinner and get ready for the husband to arrive home. We all sit down, have dinner, and talk about our days. Dishes, baths/showers and then reading before bed. Sometimes, I'll break the rules and let the kids have their kindles. BUT, I disable the wifi. My daughter will read, my son will play some KidTime educational game. By 7 EVERYONE is in bed. This is my time with my husband. We talk, cuddle or discuss who i'm killing next. I hope that answered your questions!!! Now, I've got to go back to work. Killing waits for no one, and I'm hoping to post the prologue for Sinner Repent in a week or so. Keep reading and thank you for all your reviews! I appreciate them. We're only 1 review away from 50 for The Killing Times! 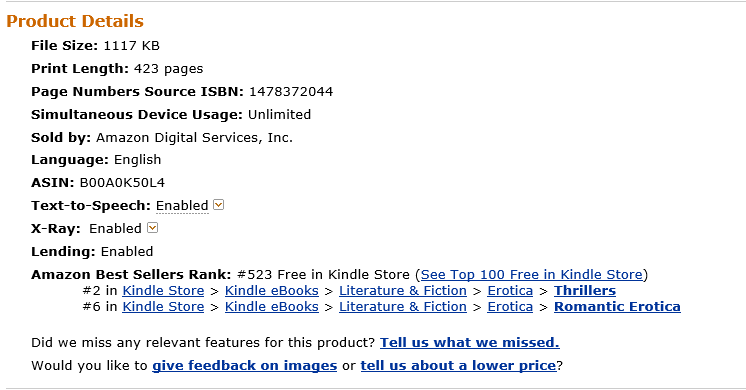 This week, we hit the top 100 again on amazon! Word is spreading! THANK YOU!